Juniper Networks introduced its MetaFabric architecture for next generation data centers with the goal of simplifying and accelerating the deployment and delivery of applications within and across multiple facilities. The key design principles for MetaFabric are to be Open (standard interfaces for integration with multi-vendor data center equipment), Simple (single pane of glass management), and Smart (leverage traffic analytics to adapt the network for cloud, mobile and Big Data applications). The MetaFabric architecture could be used in existing data centers or with next gen SDN controllers, including Juniper Networks Contrail and VMware NsX, and cloud orchestration platforms such as Openstack. A consistent control plane is used across all systems to shared information and propagate state within and across data center locations. Juniper's MetaFabric encompasses switching, routing, orchestration, SDN controllers and security hardware. Within a specific data center, Juniper's MetaFabric could be used with its QFabric family of products, Virtual Chassis technology, and Virtual Chassis Fabric switching architectures, or it could be implemented on traditional equipment. Across locations, protocols such as Ethernet VPN (EVPN) automatically and dynamically change the path for traffic flows. 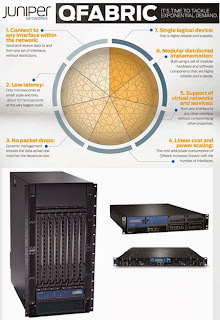 MetaFabric could also use VPLS or MPLS to link data centers. So far, Juniper has released MetaFabric Reference Architecture 1.0, which provide guidance to customers and partners deploying a VMware virtualized data center. The company said this tested reference architecture combines its routers, switches and security solutions with EMC, VMware and IBM systems running Microsoft applications. Juniper will support MetaFabric with its own professional services and with industry partnerships. QFX5100 family of 10G and 40G access switches: The QFX5100 family is made up of top-of-rack (ToR) switches designed for the hitless, zero downtime data center. 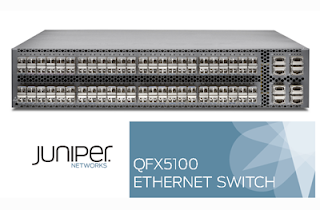 The rollout includes the QFX5100-48S, a10GbE switch offering 48 dual-mode, small form-factor pluggable transceiver (SFP/SFP+) ports and six quad small form-factor pluggable plus (QSFP+) 40GbE ports; the QFX5100-96S, a10GbE switch providing 96 dual-mode, small form-factor pluggable transceiver (SFP/SFP+) ports and eight quad small form-factor pluggable plus (QSFP+) 40GbE ports; and the QFX5100-24Q, a 40GbE switch supporting up to 32 quad small form-factor pluggable plus (QSFP+) ports. 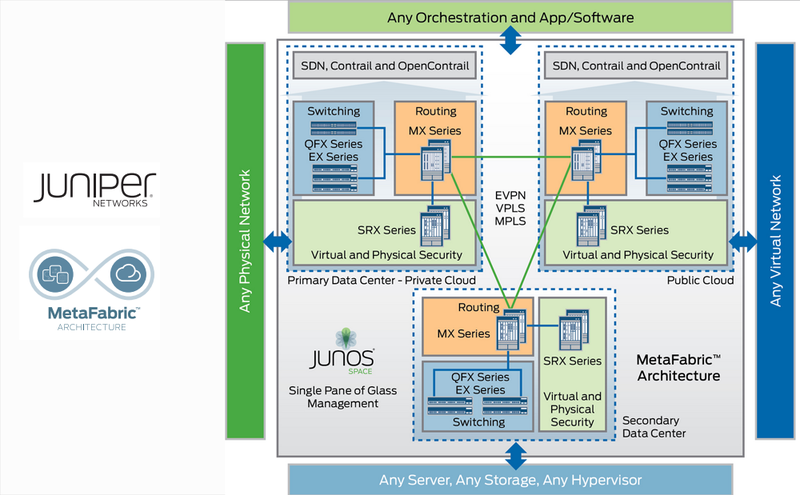 New SDN and WAN capabilities on MX Series routers: Juniper Networks MX Series 3D Universal Edge Routers can now act as universal SDN gateways to connect physical and virtual networks seamlessly. Juniper also added support for Ethernet VPN (EVPN), which maximizes performance by creating the most efficient forwarding paths across the WAN. 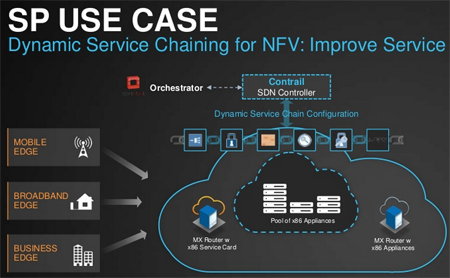 SDN solutions for data center optimization: MetaFabric can be the foundation for the emerging ecosystem of SDN controllers. Juniper Networks Contrail will support VMware ESXi, providing customers with an even broader array of choices. In addition, MetaFabric allows customers to connect Juniper systems directly to OpenStack and CloudStack orchestration platforms, and SDN controllers, such as Juniper Networks Contrail and VMware NSX. "For the first time, MetaFabric will allow companies to operate multiple data centers - physical and virtual, private and cloud - as a single, flexible pool of network resources, providing tremendous levels of flexibility and efficiency, as enterprises and service providers shift towards an application-driven world." stated Rami Rahim, executive vice president, Platform Systems Division, Juniper Networks. 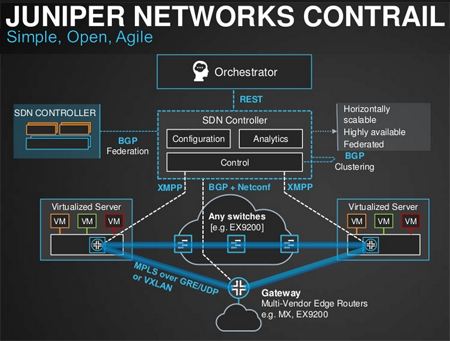 Juniper Networks Contrail, formerly known as JunosV Contrail, is comprised of an SDN controller, vRouter, and analytics engine. It creates a virtual network, enabling seamless integration between physical and virtual networks. Contrail's hypervisor forwarding plane provides line rate routing and switching in a multi-tenant virtualized environment that is completely decoupled from the underlying physical fabric switches. Contrail enables a variety of VPNs in software, including L3 VPNs, E-VPNs, Site-to-Site IPSec, and SSL VPNs. Contrail also features built-in load balancing across application tiers or network services. As for security, Juniper said its hypervisor forwarding plane includes built-in policy enforcement. Contrail seamlessly integrates with Juniper's virtual firewall, Firefly Perimeter. In addition, Distributed Threat Prevention can be delivered in software using JunosWebApp Secure. Contrail seamlessly integrates with the Juniper Networks MX, EX and QFX Series switches. The company said it will be interoperable with most industry switches and routers. In an enterprise setting, Contrail could be used for combining private and public clouds, enabling workload mobility between resources. In a Service Provider setting, Contrail can dynamically service-chain virtualized or physical network resources, such as for NFV. In June 2012, Juniper Networks introduced a smaller version of its QFabric System aimed at mid-sized data centers. The QFabric architecture, which was first unveiled in February 2011 and began shipping in September 2011, collapses multilayer data center infrastructure into a single, any-to-any fabric that unifies networking, storage and cloud computing resources. The product set is composed of three components that create a high-performance, low latency fabric. The QF/Node acts as the distributed decision engine of the fabric; the QF/Interconnect is the high speed transport device; and the QF/Director delivers a common window, controlling all devices as one. Specifically, the new and smaller QFX3000-M enables scalability from 48 10GbE ports and up to 6,144 10GbE ports using the QFX3000-G QFabric System. The smaller version delivers three microseconds latency, compared with five microseconds for the larger Qfabric. 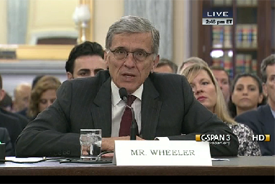 The U.S. Senate voted to confirm Thomas Wheeler as Chairman of the FCC and Michael P. O'Rielly as FCC Commissioner for the term previously help by Robert McDowell (ending June 2014). Tom Wheeler previously served as Managing Director of Core Capital Partners, a venture capital firm headquartered in Washington, D.C. with approximately $350 million under management. Portfolio investments of Core Capital Partners include Sourcefire (NASDAQ: FIRE), Inlet Technologies (acquired by Cisco), SwapDrive (acquired by Symantec), IXI Corporation (acquired by Equifax), SilverStorm (acquired by QLogic), Roundbox, Twisted Pair Solutions, BridgeWave Communications, UpdateLogic, Infinite Power Solutions, GENBAND, PureWave, Trust Digital and others. Wheeler served as President of the National Cable Television Association (NCTA) from 1979 to 1984. He then served as CEO of the Cellular Telecommunications & Internet Association (CTIA) until 2004. Mike O'Rielly is a congressional staffer for Senator John Cornyn, a Republican for Texas. 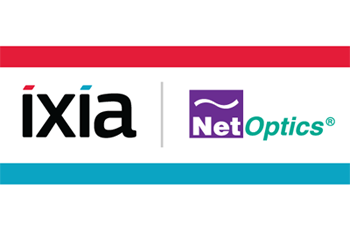 Ixia agreed to acquire Net Optics for $190 million in cash, in a cash-free/debt-free transaction and subject to certain adjustments based on Net Optics’ net working capital at closing. Net Optics, which is based in Santa Clara, California, specializes in application and network visibility solutions for real-time network intelligence. Its product lines include taps and virtualized taps, bypass and in-line switches, and network packet brokers. The company recorded revenue of $49 million in 2012. In the first nine months of 2013, Net Optics revenue grew 21% over the same period in 2012, reaching $42 million, with Q3 revenue growth of 31% year-over-year to reach a record $15.5 million. Ixia expects the acquisition to be accretive to non-GAAP earnings by the second full quarter after the acquisition closes. Ixia said the deal enhances its position as a supplier of network packet brokers and application-aware visibility solutions. The 100G Long-Haul DWDM Transmission Module IA specifies key electromechanical aspects of Generation 2.0 of a 100G Long-Haul DWDM Transmission Module, for optical line interface and specifically 100G PM-QPSK long-haul DWDM transmission applications. The module size has been decreased by 40% to 4x5 inches to accommodate technological advances made since the first module was introduced and to reflect lower power consumption. The Integrated Polarization Multiplexed Quadrature Modulated Transmitters IA specifies key aspects of optical transmitters operating at rates up to 32 GBd per channel for applications such as 100G PM-QPSK DWDM transmission. The agreement reduces the size of the transmitter to fit into the Gen 2 LH DWDM Transmission Module. The Intradyne Coherent Receivers IA also targets 100G PM-QPSK applications with nominal rates up to 32 GBd. This IA reduces the size of the receiver to fit within the smaller 4x5 module and also will now fit into future CFP modules. A fourth implementation agreement defines medium reach Common Electrical I/O (CEI)-28G-MR, for an electrical channel operating at peak speeds. This expands on the OIF's CEI work that defines the characteristics required to communicate between a CEI-28G-MR transmitter and a CEI-28G-MR receiver. This clause details the requirements for the CEI-28G-MR medium reach high-speed electrical interface between nominal baud rates of 19.90 Gsym/s and 28.1 Gsym/s using NRZ coding. Medium reach is defined as capable of driving up to 500 mm of PCB and up to 1 connector. Pacnet has activated an optical mesh network with 100G on its EAC Pacific fiber optic cable system. 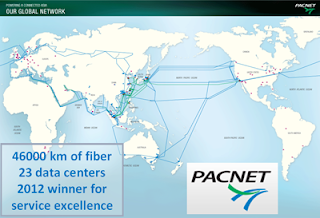 Pacnet can now offer its Carrier and Enterprise customers 10Gbps, 40Gbps and 100Gbps services between Asia-Pacific and the U.S.
Pacnet said its new backbone integrates subsea fiber infrastructure and terrestrial backhaul links supporting pure packet technology and OTN switching in the optical core. The upgrade supports both Ethernet and OTN interfaces at a location, allowing flexible selection of whether to multiplex, scale up and down, amplify, groom, optically express, or switch individual data streams. EAC Pacific is a trans-Pacific cable system providing connectivity between Chikura, located off the coast of Japan near Tokyo, to Los Angeles, California and other network Points of Presence (PoPs) on the West Coast of the United States. The two fiber pairs, collectively known as EAC Pacific, provide up to 1.92 Terabytes per second (TBps) of capacity. Pacnet owns and operates EAC-C2C, Asia’s largest privately-owned submarine cable network at 36,800 km, as well as EAC Pacific, which spans 9,620 km across the Pacific Ocean. EAC-C2C connects to cable landing stations in Hong Kong, Singapore, Japan, Taiwan, Korea, the Philippines and China. 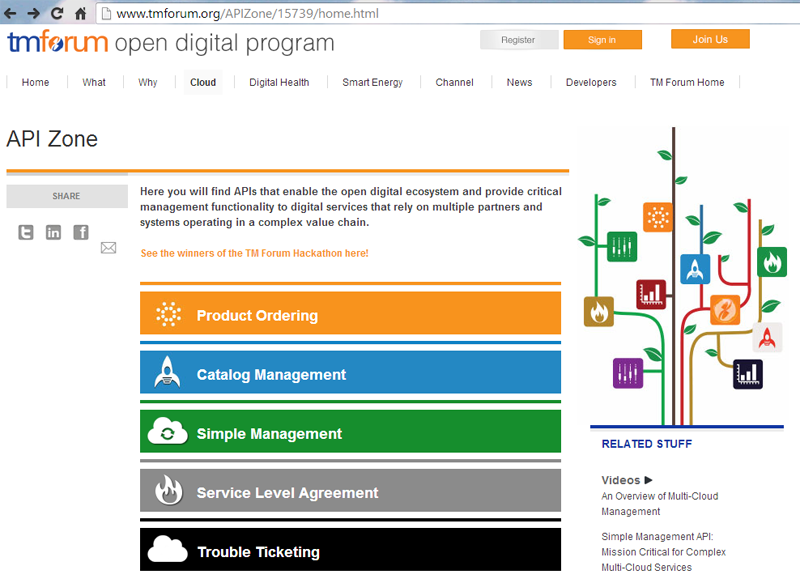 The TM Forum launched an API ecosystem containing a suite of REST-based APIs developed for end-to-end digital services management. 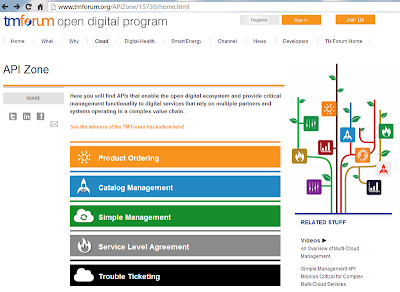 The API Zone, which is part of the TM Forum's Open Digital Program, aims to serve all digital services stakeholders including consumers, developers, providers and operators. TM Forum and its members defined and developed the APIs in a three month cycle using agile development techniques. The API Zone features four APIs: Catalog Management, Trouble Ticketing, Product Ordering and Simple Management. The purpose of these APIs is to create easy sharing of management information and expose management functions such as submitting orders or creating trouble tickets between partners. 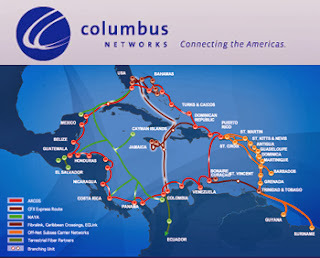 Columbus Networks, which operates the largest subsea multi-ring fiber-optic network connecting the Caribbean, Central America, Mexico and the United States in partnership with CWC Wholesale Solutions, has selected Coriant's coherent 100G solution to expand its network. The strategic network upgrade will use Coriant's hiT 7300 intelligent transport platform for multiple 100G optical transmission links in its Florida Transport Network. Financial terms were not disclosed. "We are pleased to be a strategic partner of Columbus Networks to help them advance the capabilities of their DWDM backbone network with best-in-class 100G technology," said Herbert Merz, president and CEO, Coriant. "Our revolutionary vision for software-enabled, end-to-end optical networks, combined with a proven heritage of engineering excellence, places Coriant in a unique position to offer compelling customer solutions that deliver immediate CapEx and OpEx savings while future-proofing networks for long-term growth." CloudSigma, the Switzerland-based provider of pure-cloud Infrastructure-as-a-Services (IaaS), has expanded its public cloud to a second U.S. location. 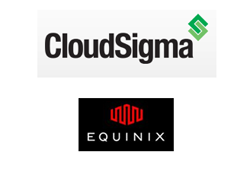 In addition to its Las Vegas cloud at SwitchNAP, CloudSigma’s public cloud is now also available at Equinix’s DC6 International Business Exchange (IBX) in Washington D.C.
CloudSigma said its dual-site U.S. hosting solution allows customers can now more easily geo-balance workloads across multiple data centers, thereby keeping their data and mission-critical applications accessible in the event of a disaster or a system outage. For instance, customers already housing their data in CloudSigma’s Las Vegas-based cloud can now simply fail over to its East Coast location or vice versa. Ixia reported Q3 revenue of $115.4 million, compared with $110.6 million reported for the 2012 third quarter. The 2013 third quarter includes $35.2 million in revenue from Anue Systems and BreakingPoint Systems, which were acquired in June and August 2012, respectively. Net income (GAAP) was $6.0 million, or $0.08 per diluted share, compared with net income of $10.9 million, or $0.14 per diluted share, for the 2012 third quarter.